We recognize that your privacy is important. This documentoutlines the types of personal information we receive andcollect when you use Golf-Carts-Etc.com, as well as someof the steps we take to safeguard information. We hope thiswill help you make an informed decision about sharingpersonal information with us. Golf-Carts-Etc.com strives to maintain the higheststandards of decency, fairness and integrity in all ouroperations. Likewise, we are dedicated to protecting ourcustomers', consumers' and online visitors' privacy on ourwebsite. 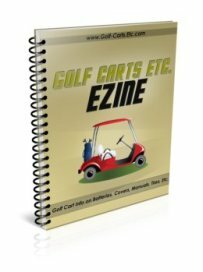 Golf-Carts-Etc.com collects personally identifiableinformation from the visitors to our website only on avoluntary basis. Personal information collected on avoluntary basis may include name, postal address, emailaddress, company name and telephone number. If Golf-Carts-Etc.com is sold, the information we haveobtained from you through your voluntary participation inour site may transfer to the new owner as a part of the salein order that the service being provided to you maycontinue. In that event, you will receive notice through ourwebsite of that change in control and practices, and we willmake reasonable efforts to ensure that the purchaser honorsany opt-out requests you might make of us. Golf-Carts-Etc.com reserves the right to make changes inthis policy. If there is a material change in our privacypractices, we will indicate on our site that our privacypractices have changed and provide a link to the new privacypolicy. We encourage you to periodically review this policyso that you will know what information we collect and how weuse it. If you do not agree to Golf-Carts-Etc.com PrivacyPolicy as posted here on this website, please do not usethis site or any services offered by this site.